This entry was posted on Wednesday, August 11th, 2010 at 12:20 pm	and is filed under Events, News, Press, Press & Publicity. You can follow any responses to this entry through the RSS 2.0 feed. You can leave a response, or trackback from your own site. As a native San Franciscan and Roadman for San Francisco Yellow Cab I was conveying a group of Canadian tourist along the waterfront to Pier 39 when I saw IT. I pointed and yelled BOOYAH as my passengers screamed in delight when they too saw IT. IT was a four stories tall Flash Gordon Rocketship to Mars, direct from the TWILIGHT ZONE, that had landed at Pier 14 as crowds of amazed citizenry gathered around IT. I shook my head and marveled as once again an extraordinary and instantly iconic gem of public art revealed itself to a delighted and appreciative audience. It is little wonder that San Francisco is the #1 tourist destination in the United States and the all-time favorite of world travelers. Pushing the boundries of ZANY and right on the cusp of EXTRAORDINARY San Francisco has once again proven that it is indeed THE CENTER OF THE UNIVERSE. 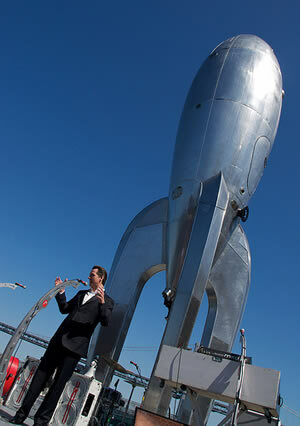 Kudos to the Black Rock artists, the Port and Arts Commission and to Hizzoner Gavin Newsom. May the Light Forever Shine.